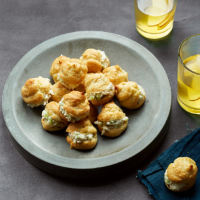 These tasty choux pastry puffs are filled with a mix of Parmigiano Reggiano, Stilton and goat's cheese. They taste great as a starter or as a pre-dinner nibble with drinks. Preheat the oven to 220°C, gas mark 7. Place the butter in a medium saucepan with 125ml water and bring to a rolling boil. Remove from the heat and tip in the flour. Beat well until the mixture is smooth and comes away from the sides of the pan. Return to the heat for a minute to cook through, stirring throughout. Remove from the heat and add the beaten egg a little at a time, beating well between each addition. Stir in the Stilton and season well. Pipe or drop 24 large spoonfuls of the choux onto 2 damp baking sheets, leaving enough space between them to spread. Sprinkle with grated Parmigiano Reggiano. Bake for 15-20 minutes until puffy, crisp and golden. Transfer to a wire rack to cool. Mix the goat's cheese with the apple, walnuts and celery. Make a split in the side of each choux bun and spoon in a generous teaspoon of filling before serving. Great as a starter with salad or as a pre-dinner nibble with drinks.